Jewish New Mexico - Our Education: As you know from Abq Jew's blog post NM Jewish Population Survey Results Announced, preliminary results of the only established permanent floating Jewish Population Survey in New Mexico have just been released. And if you've been following (you have, haven't you? 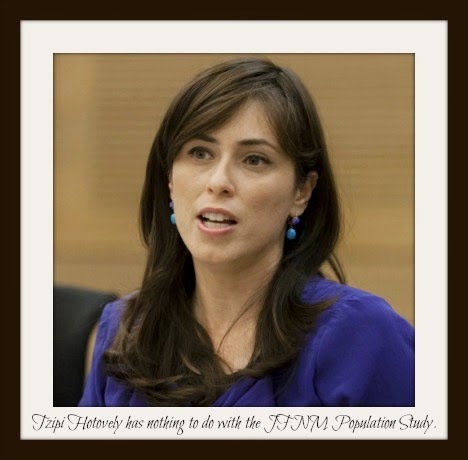 ), you must surely suspect that the beautiful and talented Tzipi Hotovely has nothing at all to do with the JFNM Population Study. What she does have to with is Transportation and Road Safety, having joined the Israeli government as Deputy Minister of same in March 2013. As of December 2014, she is also the Deputy Minister of Science and Technology. And as of March 17 - Israel's upcoming Election Day, curiously scheduled for St Patrick's Day - she could be something altogether different. Let's see what the Survey has to say about the highest level of education attained by the New Mexico Jewish community. A Yid who only has a Bachelor's Degree. 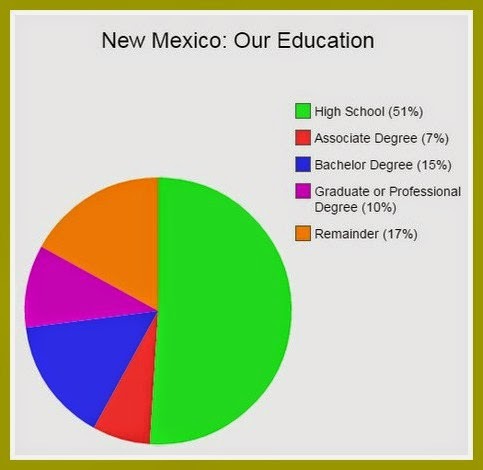 Just to compare - take a look at the pie chart that Abq Jew has thoughtfully provided. The New Mexico Jewish community has about as great a percentage of Graduate and Professional Degrees as the overall New Mexico population has of High School Graduates. And let's not even count the Remainders. 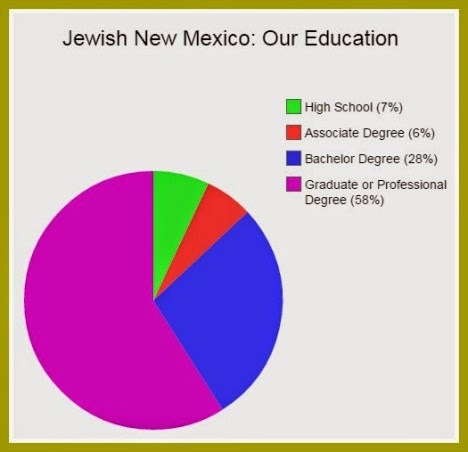 92% of New Mexico Jews have a post-High School Degree. Compare that to 32% of the general New Mexico population. Yep, we just fit right in. Abq Jew has been making fun of this, but there are two much larger issues at stake. But surely we can all agree that no child, once born, should suffer through poverty. Surely we can all agree that working to end child poverty — or at least severely reduce it — is a moral obligation of a civilized society. And yet, 14.7 million children in this country are poor, and 6.5 million of them are extremely poor (living below half the poverty line). Poor kids, hungry kids, cannot learn. 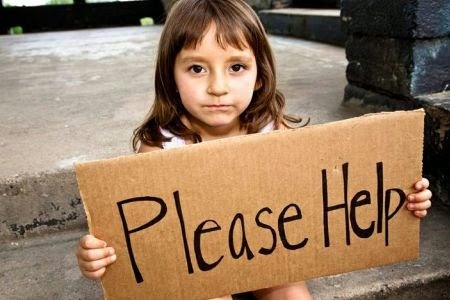 In New Mexico, 29% of children live in poor families. The national rate is 22%. New Mexico continues to rank near the bottom in child poverty and the state has been slow to recover economically and stop the dwindling of resources, a new report said. The New Mexico Voices for Children on Tuesday released its annual New Mexico Kids Count report, which also faulted state lawmakers for not presenting any new anti-poverty initiatives to help one of the poorest states. The study said the state ranked 48th nationally in child poverty and only four states ranked lower than New Mexico in the percentage of children whose parents lacked full-time, year-round employment. In addition, the report said New Mexico ranked near the bottom in fourth-grade proficiency reading rates. 2. Desire. No, not that kind. What Abq Jew means is the desire to achieve, the desire to succeed, the desire to make a big difference. The desire to know, the desire to learn, the desire to do. He who is happy with what he has. In this sense (but not in so many others), Jews are among the poorest people Abq Jew knows. Jews are (almost) never happy with what they have. They always want to do more and to have more. Yet the New Mexicans Abq Jew has been fortunate to meet are among the richest people he knows. They are happy with what they have, and - once they've got the essentials - they do not see any need for more. Abq Jew wishes they would study more, and pass the love of learning on to their children. But would this make them happier? Or would this only make them poorer?